Nature smacks down Beyoncé. Will Kim be next? Trend watchers announced that Nature may finally have begun a long hoped for comeback. In a development that caught the world off guard, last week Nature surged past Beyoncé in the well respected Google Trends ratings. S/he now has sights set on surpassing Kim Kardashian in public popularity. That will be a stiff challenge. Nature currently receives a respectable 823,000 web searches a month. 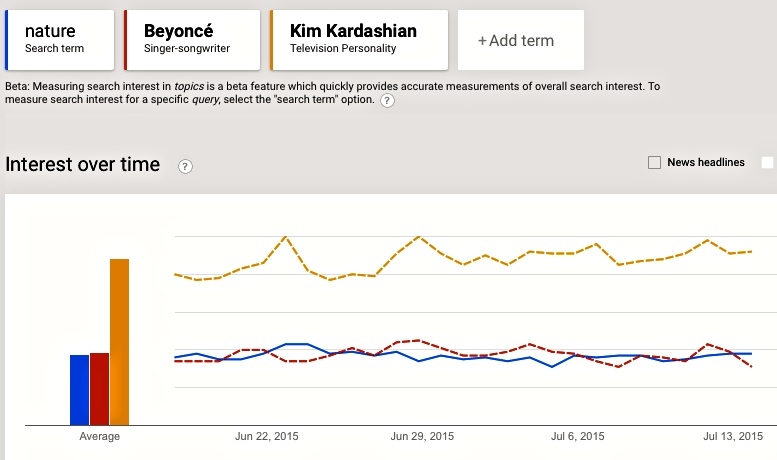 But for each search for Nature, there are nearly 17 for Ms Kardashian, who receives 13,600,000 searches a month. In a related event, The Society for Truth announced plans to file a Freedom of Information Act request for documents related to possible collusion between U.S. President Obama and Nature to conspire to cause Hurricane Sandy. The super storm severely damaged the Society’s lavish New Jersey beach headquarters and the request contends that it also benefitted Mr. Obama’s political ambitions.